Ok ladies, you might think I'm 'cheating' this week....but I prefer to consider it 'combining'! I used Sarah's Sunday Card Sketch (in more of an effort to get to do the sketch challenges, AND Use Up My Stuff)! The part of the challenge that Uses Up Your Stuff, is to use at least 2 different patterned papers (and whatever else you might want to) from your stash! Stuff you've had for at least a little while...not all that new Holiday stash! (Incentive to get to go ahead and use the new stuff....I bargain with myself, that if I use old stuff, then I can justify using the new stuff too! !-but that's probably just me over-thinking the whole business!). Don't forget to post your creations here!! We love to look and give ya some love!!! And as always, Happy Scrapping & Thanks for playing along!! uh oh, it cut my image off....I will fix that, and do it again...be back soon! Oooh Pretty Card! I think recognize that paper too... Is it Anna Griffin? Love Anna Griffin!! Well there it is, I had to resize it again. I'm still figuring out how to do it on my new computer. Thanks for the compliments! It is Anna Griffin! She has lovely designs! 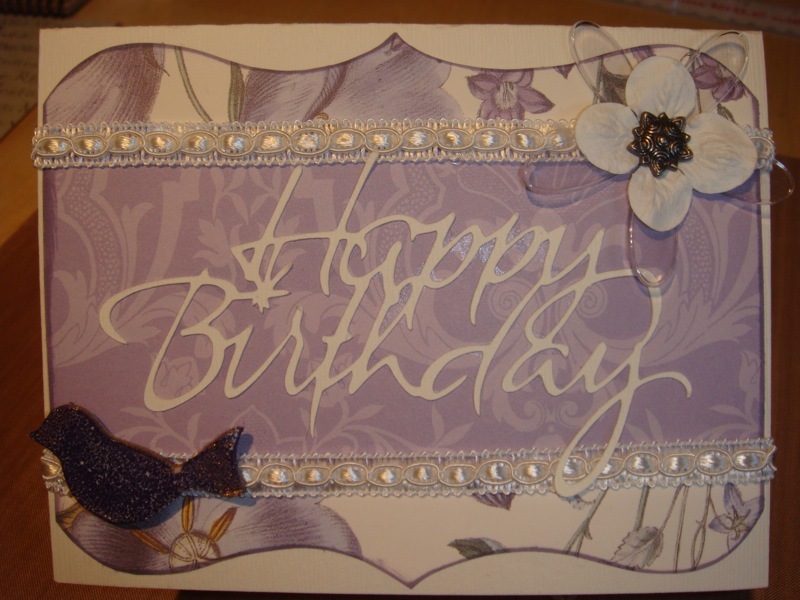 And I couldn't help the purple...has to sneak it's way in to my cards somehow, usually, lol. The font is the new calligraphy cartridge from cricut:) I got it on sale at Michael's last week. When M' had there sale I go the fairy Criscut cartridge. OH COOL! Do you like it? I need to check that one out! I haven't had time to play lately..I want to sit and play for a bit soon. Robin G wrote: OH COOL! Do you like it? I need to check that one out! very small and tedious......I was tryingt o how Dustanne today and I was growling at her for making my pieces move. I will finish glueing it and I will post soon! Jen do you use a xyron to adhere your pieces? Makes it soooo easy! I usually do but I went out and bought the wrong size! I will go and return it today! OH GOSH, I'm LOVING my new xyron!!!! I have only had my small little 'x' box, until Christmas!! THANK YOU SANTA! LOL!!! I use it for everything now! I will probably run out of my cartridge soon, and then have to cry! LOL! Yeah, I know, I'm not looking forward to purchasing those. But, many times the store here runs a 40% off xyron sale...I'll just have to pay attention!